Nigeria and Japan have signed a Memorandum of Understanding (MoU) to promote quality infrastructure development and harmonious relationship between the two countries. 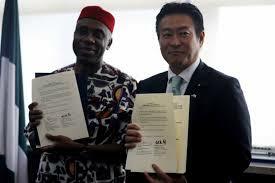 Nigeria’s transport minister Chibuike Amaechi and Japan’s State Minister of Land, Infrastructure, Transport and Tourism, Tsukasa Akimoto, signed the agreement on Tuesday in Abuja. “You have identified the infrastructure deficit that is huge, we are a developing country, so there will be huge infrastructure deficit, and it offers Japan and Japanese investors’ opportunity to come in. “Currently, we have American investors and the Chinese investors that are coming into the economy. For us in Nigeria, we will be glad to see more investors,” Amaechi said. He explained that there was two types of investment that the Nigerian government would encourage, which includes asking other government for a concessioning loan. “Usually, the concessioning loan interest rate is about 1.5 percent so we will be glad if the Japanese government can come in, like the Chinese government. “There is over 3,500 kilometres of rail, the Chinese have been able to do about 300 kilometres, before the end of the year they will do another 1,200 kilometres to bring their own contribution to 1,500 kilometres, which is based on concessioning loan. “We are talking with the Americans, but its not a concessioning loan, they are bringing their investment and they will build 1,500 kilometres of rail, including two Sea Ports. “So, we still have about 1,500 kilometres of rail, we will be glad if we can get concessioning loan from the Japanese government or get Japanese investors to do that,” he said. According to him, there are other areas like power, housing, water, works that Japan can also invest in, so there is huge opportunity for Japanese investors in Nigeria. Speaking earlier, Mr. Tsukasa Akimoto, State Minister of Land, Infrastructure, Transport and Tourism, Japan, expressed delight that there is still opportunity for Japan to build infrastructure in the country. “As you all are aware, Japan is putting in a great deal of emphasis on providing high quality infrastructure and in that respect we are not in comparison with other countries such as China, Korea and European countries. “If you look at the country cycle of infrastructure developed by the Japanese, ours is the most cost effective, you are aware that in the past there has been much discussion on Japan’s cooperation with Nigeria. “In providing the other railway and development plan in Lagos Island, we hope there will be more opportunities in the future for Japan to provide technical expertise and capacity building, including high quality infrastructure here in Nigeria,” Akimoto said.